As a mom, it is important that my family's clothes are clean, stain and static free and smell fresh and clean. It is also very important that the scent is not too strong or overpowering, especially for my husband. 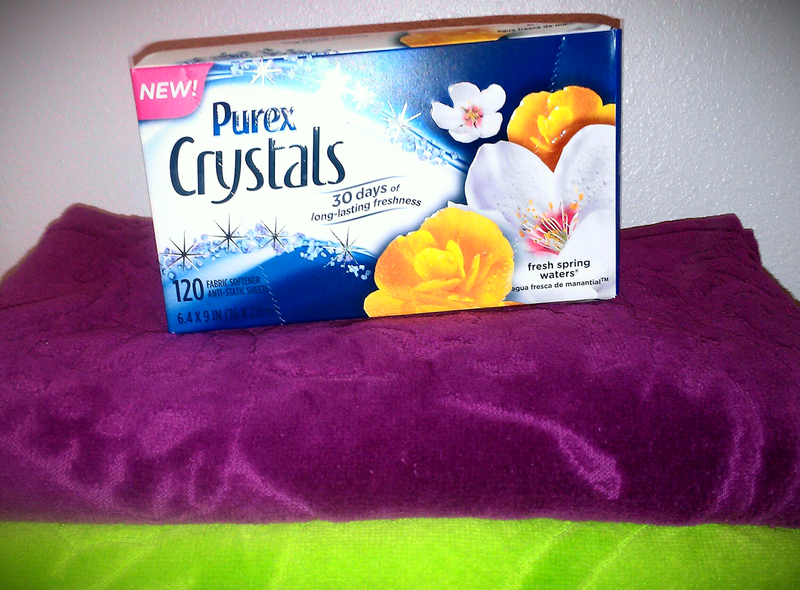 As a Purex Insider I was recently given the opportunity to try Purex Crystals Fabric Softener Dryer Sheets. Imagine my surprise when I learned that these great smelling dryer sheets also reduce static cling and repel pet hair and lint. With two very large dogs as part of our family, I was thrilled! Purex Crystals Fabric Softener Dryer Sheets don’t just reduce static cling and leave my family’s laundry soft and smelling fresh: they can also keep my whole house smelling fresh! Just choose your favorite fragrance and tuck a sheet in hampers, in the linen closets, gym bags, shoes, dresser drawers, and any other laundry storage areas. This post was made possible by Double Duty Divas and Old Spice. I was compensated for my participation in this campaign, but all opinions are 100% mine. 3 out of 4 young guys and 83 percent of young females admit overspraying is an issue. 72 percent of moms think overspraying is an issue, but only 26 percent think their sons are guilty of the offense. Nearly 70 percent of guys revealed they weren’t taught how to properly apply Body Spray. 45 percent of young guys said they reapply Body Spray because they thought their scent was fading. 90 percent of young guys and girls who have been bothered by Body Spray have been bothered by it in school. Have you heard about the fantastic nationwide money-saving deal/sale on Old Spice Body Spray? Old Spice body sprays (normally $3.99) are currently being discounted up to 50% ($1.99) at most retailers thru July 31st. 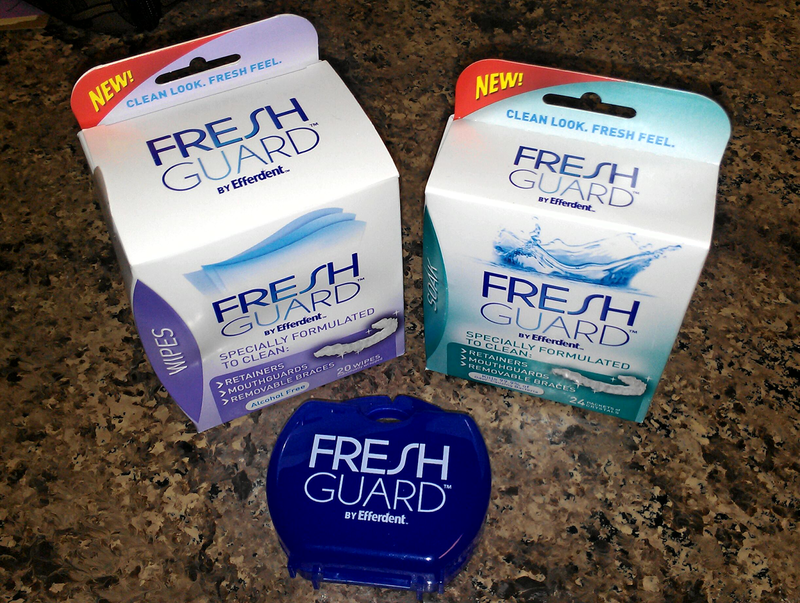 FreshGuard by Efferdent for Cleaner Mouthguards, Retainers or Clear Braces! If you’re a parent with a child that plays sports and wear a mouthpiece, or have retainers like mine - then you’ll want to hear about Fresh Guard by Efferdent. I’m a member of the Smiley 360 Blogger Circle and that allows me the opportunity to review fabulous products and share my thoughts with my readers. Here is why I was excited to try Fresh Guard by Efferdent! Efferdent™ Fresh Guard is not just for mouthguards, it can also be used on dentures, retainers, even clear braces! So if you or someone you know is looking for a way to keep their dental devices clean and fresh, I would highly suggest Fresh Guard™! The Fresh Guard Soak is for cleaning your mouthpieces and helping to prevent build up and can also help prevent stains and discoloration. Using this product is easy and all it takes is three simple steps. 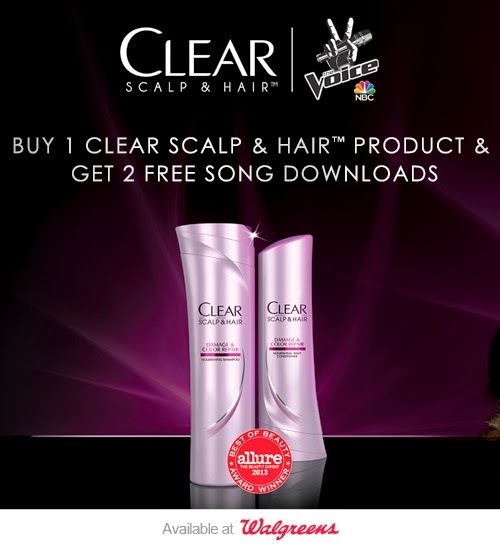 CLEAR SCALP & HAIR™ and "The Voice" for the Confidence You Need - Get 2 FREE Song Downloads! Adam Levine, Shakira, Usher and Blake Shelton... What's not to love about The Voice? I'll have to admit that I love the coaches quite a bit more than the contestants on the show. Of course, some of them are very talented - but Adam, Usher, and Blake are where it's at! This year let your hair perform for you! CLEAR SCALP & HAIR™ will make your hair beautiful and resilient by deeply nourishing your scalp. Just like the most talked about show The Voice, CLEAR SCALP & HAIR™ will give you the confidence you need to feel, look and perform your best! Have you heard that CLEAR SCALP & HAIR™ is taking resilience to the stage as the official hair care sponsor Of NBC's "The Voice"? In order to celebrate, Walgreens is offering 2 free song downloads when you purchase ANY Clear Scalp & Hair product for a limited time. You may have read my first Blog Forward challenge post, earlier this year when I talked about my New Year's resolutions. My main focus and goal for 2014 was to lose 15 pounds, although I'm not there yet, I'm still working toward that goal. I've received complimentary ZonePerfect bars for participating in this challenge. I will also entered into a contest when I complete all of the ZonePerfect Blog Forward challenges for a chance to win additional prizes for myself and my readers. I'll admit that my weight loss goal for the year and encountered a few bumps in the road. In fact, at one point I derailed and had to find the motivation and inspiration to pick myself back up and get back on the right track! The first weekend in May, my daughter and I completed a 12K together, Bloomsday 2014. 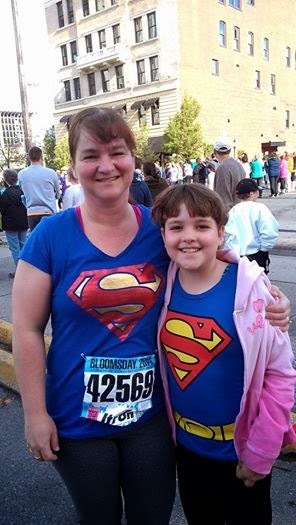 I've shared the photo of us at the beginning of the race wearing our "Super"girl shirts! The weather was perfect, it was a beautiful day for a walk, and I loved being able to share the experience with my daughter. Getting myself focused again on my weight loss goal and overall journey to becoming healthier and more active has really improved my attitude. I have more energy and I'm feeling much better about myself. Even though I haven't reached my goal weight, just knowing that I'm working on it, is enough! After all, I didn't gain it in a day and I'm not going to lose it in a day. It really is a lifestyle change, and I'm willing to do it for my children, my husband, and most importantly... ME! In addition to walking daily, 2 - 4 miles, I'm not drinking any calories. I'm drinking ice water infused with fresh fruit, and even vegetables. 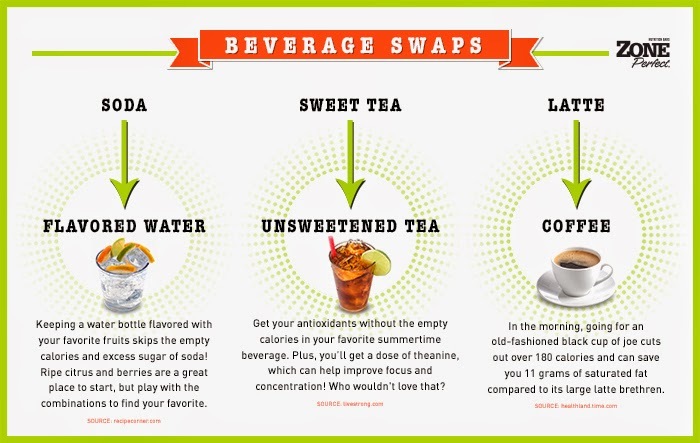 One of my personal favorites is water with lemon and cucumber slices, and a few mint leaves. I add it all to a pitcher and let it set overnight. Whether it’s caused by a work deadline, chaotic day with the kids, or visit from the in-laws, stress stinks… literally! Out of the three causes of sweat—heat, activity, and stress—stress sweat has been proven to smell the worst. Luckily, Secret® Clinical Strength has got you covered when stress strikes. Moisture activated, and formulated with odor-neutralizing ingredients that release a fresh scent, Secret Clinical Strength is proven to give you 4 times* the protection against stress sweat. 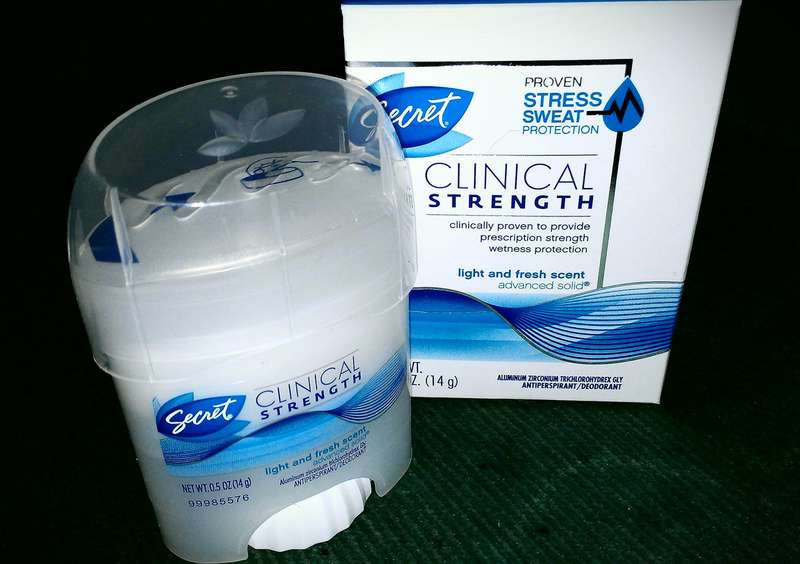 I was recently provided with a Walmart gift card from Secret in order to check out one of their two new varieties of Secret Clinical Strength deodorants. Now available in two new forms, clear gel and invisible solid, Secret Clinical Strength will help keep you feeling dry, fresh, and fearless all day long! I chose to try the invisible solid, I just prefer a solid deodorant over the gel form. If you are new to developing an online store, finding an online shopping cart builder may not be your first thought. In fact, you may not even really know what an online shopping cart is. An online shopping cart allows the customers of your web venture to place items in a ‘cart,’ review an order and check out their items. Many aspiring online businessmen and women fail to recognize the importance of this software. Baymard.com averaged cart abandonment rate (leaving a website and failing to make a purchase after items have already been put in the shopping cart) at 67.89%. This very high statistic shows that it doesn’t take much for a potential customer to back out on a purchase. Why is that? According to ipage.com, although there are many factors that explain this trend, failing to invest in a quality online shopping cart will more than likely drive visitors away from your online venture. This article describes the main two types of online shopping carts and which one may be best for your site. Hosted shopping carts have been developed to help new online business owners to offer quality shopping cart platforms that work and don’t require much technical knowledge. The host website usually sets up the online shopping cart as well as other features of the online boutique and make it ‘user friendly.’ You can start selling very quickly and don’t have to worry about hiring an outside consultant to ensure the website is functional before you open your site. This post brought to you by Swap.com - Kids' Consignment. All opinions are 100% mine. If you are a frugal shopper who likes to make your budget stretch and still be able to provide your family with everything possible, then being a savvy shopper is second nature. As a frugal mom myself, I'm always looking for ways to save money and get just a little more. Shopping clearance sales, consignment shops, and using coupons are just a few ways that help me achieve my money saving goals. Swap.com - Kids' Consignment, launched in early 2013, and has over 50,000 pre-owned treasures in its inventory just waiting to find a new home. Everything you can imagine, from adorable baby and kids' clothes, baby gear, fun toys and games, great movies, video games and stylish maternity clothes. While the items are owned and priced by the customers; the inspection, quality grading, photography, storage and shipping of all items is handled by Swap.com. The countdown to National Mom's Nite Out is on! On May 8th, moms everywhere will be joining together in the ultimate celebration of motherhood. No matter what your plans are for the evening, there's one place you definitely should not be - slaving over the stove! That's why we're so excited to share an exclusive National Mom's Nite Out #PapaMurphysMNO offer from our friends at Papa Murphy's. Papa Murphy’s wants to help feed your family on National Mom’s Nite Out! 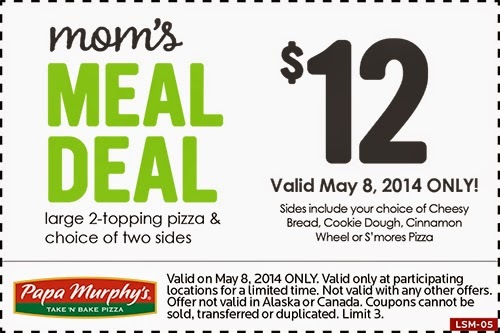 On May 8th, at participating Papa Murphy’s locations, you can take advantage of the Mom’s Meal Deal*. For only $12, you can treat your family to any large 2-topping pizza and your choice of 2 sides: Cheesy Bread, Cookie Dough, Cinnamon Wheel or S’mores Pizza. This is a great option for Dad to feed the kids while Mom is out celebrating, or simply a great excuse to take the night off from cooking!